Student: I think I’ve earned an A. Teacher: I don’t think you have. So for the next school year, I gave the students a document that defined what it would take to get an A, B, C, D, or F. And when I did have a student or two saying they thought they earned something more than their performance suggested, all I had to do was point to the grade agreement and our path forward became clear. In other words, students would either see if they could do more work to get where they wanted to end up with their semester grade or they agreed with me and all was fine. And the next school year, I invited the students to help create that document with me–but because I gave them the grade agreement from the previous year as a starting place, the content of the grade agreement we ended up with was pretty much the same save for a few changed words here and there. And rather than spelling out in great detail what made an A, B, C, D, or F like the grade agreement had the year before, this version just articulated what it took to get an A and said that a B was most of that, a C was some of that, a D was little of that, and an F was not doing the work period. This year, I want the grade agreement to reflect my students’ goals as learners much more authentically. You may be wondering why, after a few years of doing this, I don’t just craft a grade agreement that would be efficient to use and clear for the students to understand based on my experiences with the previous two grade agreements. I could do that. Yes, I could. But involving the students in the process of determining the grade agreement is a critical step toward providing students the opportunity for them to own their learning. It’s messy, and it takes time, but it’s so so worth it. The week before last was the week I had identified as the time to craft the grade agreement. I identified that week because the first 6 week progress report grades were due to be posted by that Friday afternoon. Rather than me putting in a grade for this progress report for each student, I wanted the students to do some self evaluation and goal setting against the proposed grade agreement that we would build together. This would get them USING the grade agreement at this early stage in the semester, at a point where they could change course if needed now before they get too entrenched on a trajectory that might lead them away from whatever semester grade they were hoping for. I was nervous about engaging this conversation. 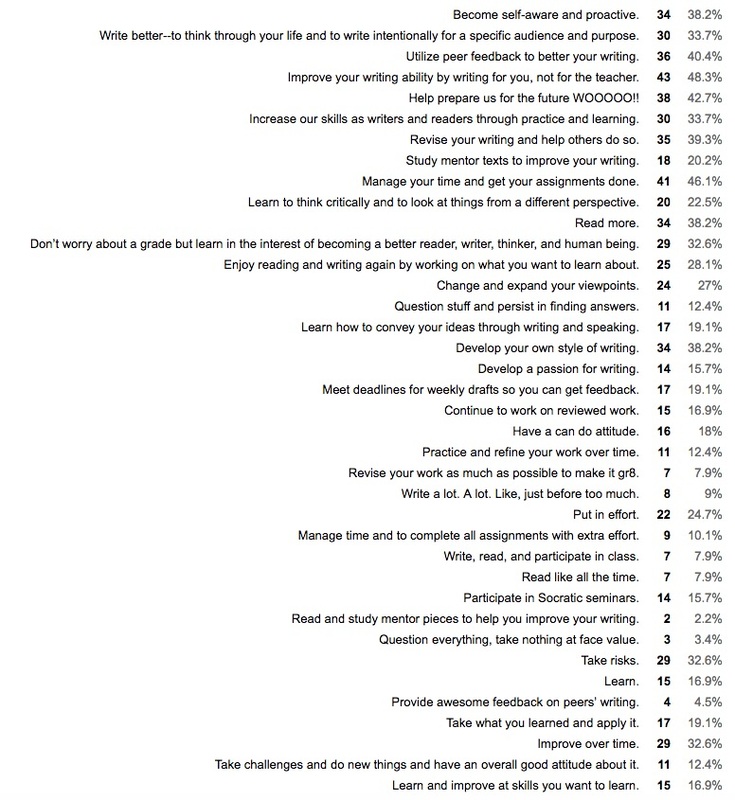 My students are writing–a lot. They are turning in drafts week after week that are (for the most part) genuine and authentic on topics that matter to them. They are reading and responding to each other’s work with care and thought. They are reading (over 90% of them actually read Into the Wild in its entirety!). They are preparing for and participating in Socratic seminars. They are working in their writer’s notebooks. And they are doing all of this without me paying them with a single point or grade in those first six weeks. My gradebook is overflowing with qualitative data about their work and already we are seeing growth. I worried that by engaging a conversation about grades I might throw off all the good vibes we had established, that I might harm the classroom community of writers and readers we are building, that students might stop working for them and start working for the grade instead. But I knew we had to have the conversation. It would be unfair to not define the work it would take to get to the semester grade, the one high-stakes data point for my classroom. The last thing I want is for a student to get to the end of the semester, thinking he’s earned an A, but for us to have completely different ideas about this. So we had to have the conversation. And I totally blew it in the first of my three senior classes. Within a few minutes, they weren’t with me anymore. I thought I had orchestrated a conversation that would engage all of their attention, but instead, they were breaking down in side conversations and working on other stuff at their desks or tinkering with their phones. They were physically in the classroom space with me but they weren’t doing the work with me anymore. I had lost them. I had started the conversation by giving students individual printouts of the gradebook data I had collected on each of them. I pointed out that the number at the top was not their grade but rather an indication of how much of the work for the class they had each completed. I told them that if the number wasn’t 100%, they had something they needed to take care of. I asked them to look over their data and identify what they needed to do to get that number to 100%. I need to remember my writer’s memos. I need to go back and figure out what I missed in the instructions on some assignments. I need to take care of some missing tasks. It was with my next questions where things started falling apart. I asked them, what seems to be the work of this class? What should it take to get an A on that work? It was halfway through working on the second column that I realized I was working on it alone. I made a table on the google doc I had up on the screen and begin filling it in as I asked them for their ideas. As you can see, we never finished filling out the table. Collecting their ideas for the column about the work of this class went pretty well and quickly. It was when I was collecting their ideas for the second column that I lost them. I realized it felt like I was doing the work myself. The way I had set up the conversation shifted their focus from the learning we had been all about since day one now to that same old grade conversation, and they didn’t like it, so they checked out. Every single time I have had these conversations with students, they tell me that they want the grade to reflect growth, improvement, learning–not mastery, not meeting requirements. Yet there I was guiding them toward making a list of requirements for our grade agreement. Looking back over my grade agreements the last two years, I can see that they have been basically lists of requirements. They were rubrics. I felt like I needed to have something that was very clear and objective in the end to help us with grade negotiations. I felt like I needed something in place to ensure that all of my students didn’t give themselves As, especially if they hadn’t really earned them. I felt like I needed something that made it very clear what kind of evidence needed to be there to get that A. But making it clear brought me to a rubric, a list of requirements, a checklist of stuff to take care of. These are all the things I’ve been avoiding with my move away from traditional grading. I am grateful that my lesson plan blew up on me with that first class. The honest conversation I had with my students after things fell apart helped me to realize that I needed to shift MY thinking on what the grade agreement could look like. My students were asking for something different–something really truly focused on the learning that mattered to them rather than a list of requirements that a teacher put together. With the help of that first group of students, I changed my questions for the next two classes. I still started with the printouts of the gradebook data I had collected on each student and the conversation about what the number at the top meant and time for each student to examine what they could do to get that number up to 100%. This was an important first step–it got students steeped in the data records of their work so far this semester, connected to just what the class has been asking them to do, work on, and think about. What is this class asking you to learn? What work do you need to do in order to accomplish that learning? This was looking much more productive. It’s less a rubric or checklist and more a list of what my students thought the class was asking them to learn. Immediately I see student language rather than teacher language here. That suggests to me that they own the goals you see articulated here. The grade agreement we’re working toward will be theirs, not mine. After they filled the table, we spoke briefly about what it would take then to get an A. “Is this the work? Have you already defined it?” I asked. They had some more ideas. I did the same process with the last of my three senior classes–even took a time lapse video of the google doc as they filled it with their ideas, all of them on the same google doc at once. Here’s what that third group of students put together to articulate the learning the class has asked of them and the work it will take to learn. 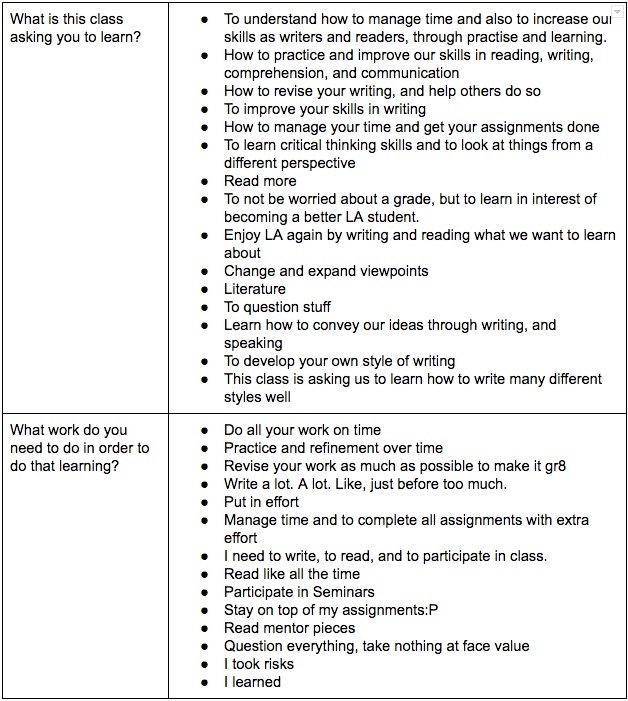 I loved seeing things here like “how to revise your writing and help others to do the same” and to “enjoy LA again by writing and reading what we want to learn about” and “write a lot. A lot. Like, just before too much.” I love that these are their words, not mine. I love that they are articulating work that is meaningful and genuine. I love how much this doesn’t look at all like the grade agreements I’ve put together the past two years. I needed to turn in progress report grades for the first 6 weeks within the next 24 hours and my initial plan had been for them to self evaluate on our shiny new grade agreement and set goals for themselves for the time ahead. The grades they chose and the goals they set for themselves is what I planned to put into the system for their first six weeks progress report. 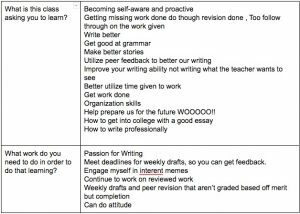 But what I had was two awesome lists of student ideas about the learning and work of the class–but neither of these were something that could function as a grade agreement. The lists were long and there were overlapping ideas. What to do? I didn’t want to narrow the lists down. I wanted my students to do that. So I set up a google form to collect students’ self evaluations for progress report and to have them help me narrow down the lists. I combined everything my students had come up with into one list, called them “goals,” and asked students to identify up to ten goals from the list that would inspire them to work genuinely and authentically in the class. This shows how many of my students identified each of these goals as something that would invite them to learn authentically. I also asked them to determine what grade they would give themselves at this point imagining that the goals they checked off were the ones that the grade connected to. Here are the grades my students gave themselves for the first 6-week progress report. Here are my students’ target grades for the semester. But I still don’t have a grade agreement from all of this. Examples of where students have accomplished this. Conference notes in the gradebook. Revision memos showing which of the target standards a student is working on for individual pieces of writing. 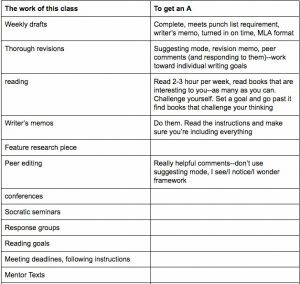 The punch list (a document that is essentially a list of tasks for the semester–types of writing to work on–to guide students’ choices from week to week for their weekly drafts). I was pleased to see that the work I’m asking students to do does indeed provide a body of evidence for the goals my students identified themselves as meaningful work for the class. And I was also pleased to see that there was some overlap between my students’ list of goals and my list of learning goals for the class that I wrote over the summer in that time when there’s actually space to think deeply about these things. But I worried that the list of 12 goals that my students identified as most meaningful would be overwhelming for them. Twelve goals–would they need to provide evidence they’ve met all 12 of them for an A? This felt onerous to me. I don’t want the end-of-semester reflection/self-evaluation work to be a huge, silly task to students. I want it to be meaningful, I want the work they do on it to solidify what they’ve learned, and I want my students to be proud of their work and not annoyed for having had to do it to begin with. A = provide thorough evidence you’ve met all five goals. B = provide thorough evidence you’ve met four goals. C = provide evidence you’ve met three goals. D = provide evidence you’ve met two goals. F = don’t do the work. Incomplete = you still need to finish some of the major tasks for the class. But I will propose this to them and see what they think. I’m actually pretty nervous about this. It’s got so much more wiggle room than what I’ve had before. I have to trust my students more with this grade agreement. But I have a hunch that the writing I’ll get from my students explaining which grade they think they should get and how they know based on the work they have done and the data I’ve collected on them will be an opportunity for truly meaningful reflection on their learning. My purpose here is to present them with something that clearly defines what it takes to earn the semester grade that they want but that doesn’t feel like grading as usual. This approach is sufficiently different from what I’ve done before that it might actually get us there. The vagueness here (read this article for a college professor’s reflection on vagueness) is somewhat unsettling for a teacher who has operated for many years on the assumption that I had to define very clearly and specifically what success looks like. I did that with rubrics and checklists and things that felt like they were objective. Let’s just get over that right now. There is nothing objective about evaluating readers and writers and thinkers. The fine-tuned rubrics and point systems we’ve built and use appear objective but they revolve on subjectivity. I’m working to become more and more comfortable with that. I know that when I give students a meaningful launch point, a general direction, examples/mentor texts that provide intriguing possibilities, and support and time to work, they are capable of much more than I can imagine. This is the twelfth post in a series about not grading in the high school language arts classroom. You can read other posts in the series here. Start with the first post, “The English Teacher’s Holy Grail: #StopGrading” to read about how this series came to be. This blog series will chronicle my journey through the 2016 fall semester using non-traditional approaches to grading, the thinking process I go through with my students, the steps we take along the way. I’m doing this for entirely selfish reasons–I want to capture it as clearly as I can, which will make it all work better for my students and me. I hope that being along for the journey will help you think about your classroom too. Please check out this folder –it already contains some of the key documents about non traditional grading out of my classroom, and this is where I will store any documents I create or revise during this semester’s journey. Check out this folder if you’d like to share your gradeless classroom resources with each other (and with me!) and/or enter into more conversation by joining the Google Group a reader set up. This entry was posted in #StopGrading, assessment, blog series, fall 2016 blog series, grading, making change, muddling through, not grading, student feedback, surprises. Bookmark the permalink. Dr. Z, this post is very helpful and comes at just the right time for me. Thank you so much for sharing this whole series because it has really been a helpful guide for me this year. I have not been perfect in my move away from grades, but I would be lost without your posts. This is fascinating! I have not made the leap yet, but I really think it would make sense, especially as I teach a “lab class” that is a reading course kids have to take if they seem to be struggling. Why does it need a grade at all? My grad school MAT program was pass/fail, with lots of feedback. Most of us passed. Some people had to rework and resubmit their final portfolio. But as long as we were demonstrating thought, effort, and learning, it was accepted. I also know I’ve gotten some As in my life in courses that I didn’t learn much in, or put forth much effort in, and I’ve gotten Bs and even a C or two in courses where I worked hard and grew a lot. I love how you recognized the disconnect as it developed and asked your students questions that helped get things back on track. That is important, but difficult, to do. Why does there need to be a grade at all indeed. My doctoral dissertation was pass/fail. I had to keep working on it until it was strong enough, until I had learned from it what I needed to. Never a grade in the whole process on that project–just lots of feedback and conversation and revision revision revision. Pingback: Adventures in Assessment | Teach to learn. Learn to teach.